← How to Upload DJI Phantom 4 4K recordings to Instagram? A wide variety of devices are used for shooting video: drones, but most of them save video in non-standard formats. This can cause problems, for example when you want to upload DJI Phantom 3/4 video to YouTube and the service doesn’t support your video’s format. According to the rule, video file size is limited to 2GB for YouTube uploading. But 20GB is allowed by using an up-to-date browser. Video size refers to video resolution. Since YouTube applies 16:9 aspect ratio players, uploading a 16:9 video file could be the best choice. The following resolution plans are the frequently-used ones. Above are the best YouTube video size dimensions for upload. For those video files in 4:3 aspect ratio, YouTube player will automatically display videos with pillar boxes or letter boxes to play videos properly. This is why some YouTube users will find black bars on the sides of YouTube video. To fit for the player, you can change 4:3 to 16:9 with ease. Step 1. Load DJI Phantom 3/4 videos video by clicking “File”. Step 3. The default settings may not satisfy you, and you can click the “Settings” button to change the settings by yourself including video resolution, bit rate, audio sample rate, audio channel etc. for full screen playback smoothly. Or keep no changes, which is also a good choice. To output high quality YouTube video, setting ideal resolution size isn’t the only priority. Other encoding settings are not supposed to be ignored, including video format, bitrates, codecs, etc. Frame rates: it is recommended to make frame rates match the source material. Bitrates: Compared with other settings, bitrate is less important. For advanced users, you can refer to the table below. Step 4. Hit Convert to begin converting videos to YouTube best video size. 1. Go to YouTube.com and login your account. 2. Click the “Upload” on top right to open video upload window. 3. In the middle area, hit the “Upload” button to upload files or drag and drop the files you desire to upload to this area to start the uploading process. 4. 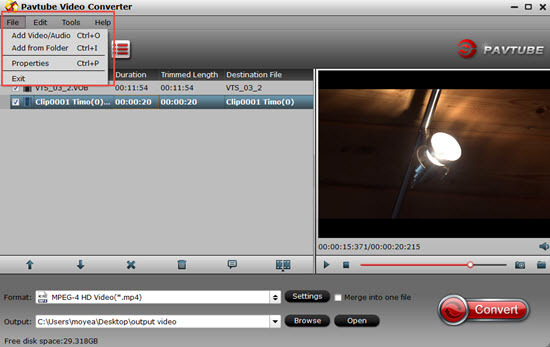 During the process, fill the information of the videos. 5. When the uploading process is finished, you can publish the video to YouTube for share. Does VLC support DJI Phantom 3/4 4K recordings?